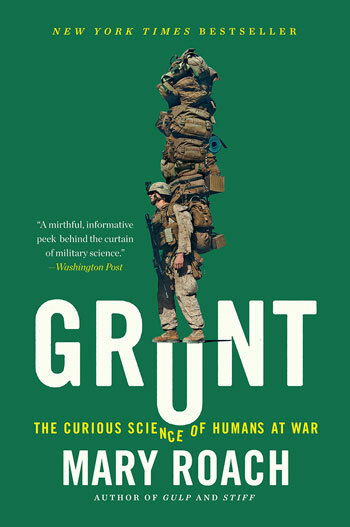 Grunt tackles the science behind some of a soldier's most challenging adversaries—panic, exhaustion, heat, ​flies, ​noise—and introduces us to the scientists who seek to conquer them. ​Roach ​​visits a repurposed movie studio where amputee actors help prepare Marine Corps medics for the shock and gore of combat wounds. At Camp Lemmonier, Djibouti, in east Africa, ​she discovers that diarrhea can be a threat to national security. Back in the US, fashion design​ers at U.S. Army Natick Labs​ explain why a zipper is a problem for a sniper. Roach samples caffeinated meat, sniffs an archival sample of a World War II stink bomb, and stays up all night with the crew tending the missiles on the nuclear submarine USS Tennessee. She answers questions not found in any other book on the military: Why is DARPA interested in ducks? How is a wedding gown like a bomb suit? Why are shrimp more dangerous to sailors than sharks? Take a tour of duty with Roach, and you’ll never see our nation’s defenders in the same way again.